After a whirlwind romance, a Vegas wedding and two short months of marriage Snow comes to realise that marriage to Caleb is a package deal which includes his racist and malicious parents. Rather than living with people who think of her as white trash and unworthy of their son, she steals away in the night. Eighteen months later, her life is anything but easy but she has a business in the small town of Ardent Springs, a group of friends and happiness. Then Caleb who has been searching for her ever since she ran away walks into her shop with the single purpose of taking his wife home. She knows she can’t return to Baton Rouge and her frosty parents-in-law and she’s just as certain that he will grow bored of Ardent Springs very quickly. But Caleb is determined to win her back and is willing to do whatever it takes. Contemporary Romance has been a bit of a wasteland for a couple of years. It’s been one rehashed plot after another and I’d all but given up on the genre. Then a friend told me about a new author who was writing great fiction –– this friend isn’t a particular fan of the genre and I thought, ‘if she’s impressed I definitely need to have a look’. Terri Osburn is a bright shining light in CR. She’s right on top of the mountain with intelligent well written stories and this one is another solid gold 5 star book. Favorite author. Favorite book. Honestly she could write a menu for her local Chinese Restaurant and I’d buy it. She’s that good. Many thanks to Montlake Romance and Netgalley for providing me with this ARC. 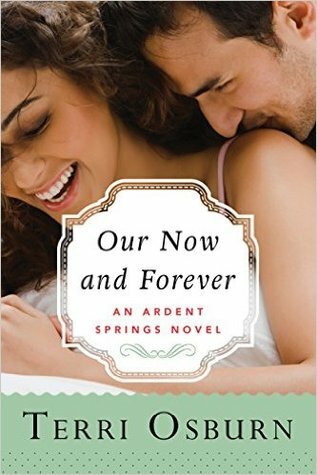 This entry was posted in Uncategorized and tagged Ardent Springs, contemporary romance, our now and forever, Terri Osburn by setaian. Bookmark the permalink.